There are headphones, and there are noise cancelling headphones. They are over ears, and perform great isolation both actively and passively from the surrounding noise, while giving you a great immersive sound experience. 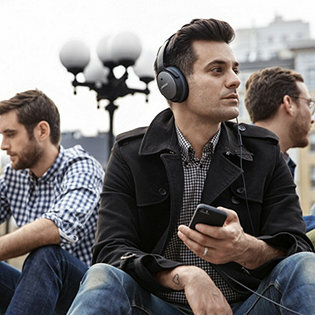 Noise cancelling headphones are clever little devices who listen to all the noise around you, invert them (or turn them into the exact opposite), super impose it on whatever is (or isn’t) blaring out of your headphones, and in doing so, try and cancel the noise all around you. While it doesn’t work great for people chatting around you, uniform kind of noise, like the one in a plane, a train, air conditioners, or even background noise of people in a coffee shop does disappear. 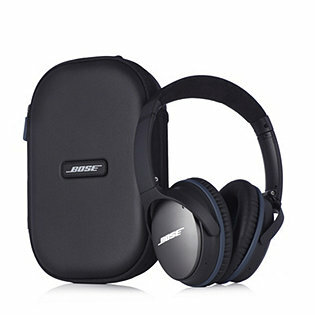 The Bose QuietComfort 25 are one such device. These over-ear headphones are designed with a premium feel and comfort in mind. The ear cups are quite big, and I imagine they should go over even big sized ears. Cushioned headband means it never feels too heavy. Overall it is a bit on the heavier side, but having worn it for a few good hours for many days on a row, it never feels too uncomfortable. The device comes with a cable which allows you to take/receive phone calls, or play and pause music. It also allows you to control volume if you plug it into an Apple device, but the feature doesn’t work for every device. The cable is interesting in the sense that it features a 3.5mm connector on one end, while the other end is a bit thinner. So a standard cable cannot be used. On one side is a little flick switch which turns the noise-cancelling feature on or off. Probably the best feature about this is the fact that the headphones work regardless of you using the noise cancelling feature. This provides active noise cancelling, and apart from the one case that I know of, no other headphone actually can do this without using power, and that means using batteries. The Bose QuietComfort 25 is powered on 1 AAA battery. However, if the battery runs out, or you want to turn the feature off if you don’t need to, you can just listen to music as per normal headphones. Most noise cancelling headphones don’t like this, and while you can hear some sound, it isn’t good quality sound. The noise cancelling performance on these is pretty good, and what you would expect from a Bose headphone. I work in a lab which has very noisy air conditioners as well as things such as vacuum pumps running. Needless to say, it is a whiny noisy lab to work in, and these are a life saver. They cut away the noise, and I can isolate out everything apart from whatever music I am listening to. When it comes to sound quality, these are really well balanced. The sound is neither tinny, nor bass heavy, yet everything is well defined. I have tried various genres of music through them, and they have all been great. These headphones may be on the slightly pricier side, but they provide great quality sound, good noise isolation, both active and passive, and the slight touches such as the included carry case mean that they can easily fit in your bag whenever you are travelling. Definitely recommended.